Introducing Panasonic's AF1 Series: the industry's most adaptable, flexible, and versatile signage display solution. Its powerful OpenPort PLATFORM™ operating system not only allows for extensive display customisation in a wide variety of applications, but also makes installation and everyday operation easier than ever before. Simple, expandable, and reliable, the AF1 Series has an Android™-based OpenPort PLATFORM™ powered by a high-performance SoC (System on a Chip) featuring a 1 GHz quad-core CPU, 1 GB of memory, and 8 GB* internal storage. Together with verified apps created by global alliance software partners for custom signage and other roles in business, these adaptive displays deliver your message with maximum impact now and in the future. * Total capacity of storage including OS. The OpenPort PLATFORM™ based on Android™ is fully certified by Google to assure stable, secure, and reliable operation. 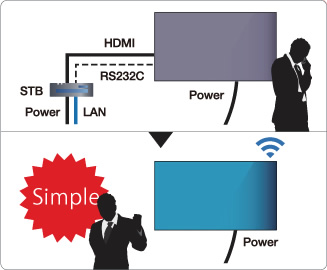 Thanks to the built-in media player function, external devices such as set-top boxes, PCs, and associated cabling are not required for digital signage applications. Wireless functionality paves the way to simple, stress-free installation while saving you time and money. 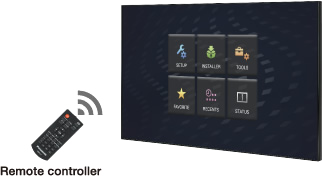 Configuring network and language preferences is easy using the supplied remote controller* via the original Panasonic Home Screen. Applications are easily accessed and installed via Panasonic App Server*, which streamlines settings before operation. App installation is also enabled via USB drive or microSD card. Panasonic's clear and intuitive API (Application Programming Interface) enables the expansion of application functions, allowing the display to be controlled remotely without need of RS232C or other complicated applications. USB drives and microSD cards can also be used to expand the 8 GB internal memory storage capacity. Peripheral devices such as a mouse, keyboard, or USB camera can be connected to AF1 Series displays to further expand their functionality. Note: Some USB devices are not supported. Easily copy settings data from a master display to other displays using a USB memory stick. This reduces labor and ensures consistency when setting up multiple devices. * Function supported on displays of the same size and series only.